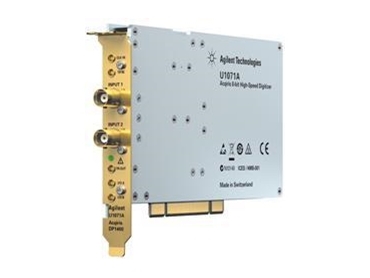 Agilent Technologies have introduced four new versions of their low-power U1071A line of Acqiris two-channel, high-speed 8-bit PCI digitisers. The new digitisers give users precise and cost-effective measurement data, and are designed specifically for small to mid-sized test and measurement applications. The U1071ATM digitisers are designed for use in research and educational experiments such as high-energy physics, nuclear physics, astrophysics, medical imaging and commercial ultrasonic testing, 3-phase power testing, automated test equipment, and the validation of mixed-signal semiconductors. Digitisers use Agilent ASIC technology to provide precision measurement to efficiently capture key events, while high-performance data conversion reduces the number of measurements required, speeding up test time. The U1071ATM product family provides clock accuracy of 2ppm for low distortion measurement. Trigger jitter of 2 picoseconds maintains low noise, delivering a high effective number of bits (ENOB) over the full frequency range. Measurement time is reduced by allowing data to be stored in the large onboard memory or virtually streamed through the high-speed PCI bus using the simultaneous multibuffer acquisition and readout mode. Digitisers are easily integrated into existing systems and provide high channel density due to their short PCI format; needing 20W of power. Digitisers offer the option to auto-synchronise up to six channels within a desktop PC to a 2GHz internal clock. U1071ATM digitisers offer acquisition memories up to 128 Msamples per channel, or 256 Msamples when channels are interleaved. They also offer bandwidth range from 200MHz to 1GHz and sampling rates that go up to 2GS/s. Software drivers for Windows(r), Linux, LabVIEW RT and VxWorks enable the U1071ATM digitisers to easily integrate into existing measurement systems as well as to be exchanged, replaced or upgraded to the latest high-speed Acqiris-based digitisers with minimal software adjustments. In addition, application code examples are also included for MATLAB(r), C++, Visual Basic, LabVIEW and LabWindows/CVI. U1071ATM high-speed digitisers are part of Agilent Technologies’ PCI, CompactPCI and PXI digitisers. This full line of digitisers is used in test and measurement applications such as semiconductor component test, hard disk drive production test, industrial non-destructive testing and time-of-flight measurements for ranging and inspection applications such as LIDAR and ultrasound. For OEM customers, Agilent Technologies provide custom product configurations (U1071A) tailored to the specific needs of their embedded applications.